Directed by Neil Burger, Divergent is based on a series of young adult novels by Veronica Roth, set in dystopian Chicago, where society is broken up into five factions, which determine how people live their lives. The story follows Tris Prior (Woodley), a teen who must choose whether to stay in her family’s faction or choose another one and begin her training to find her place among her people. Theo James plays Tris’ trainer and — as the clip indicates — eventual love interest. 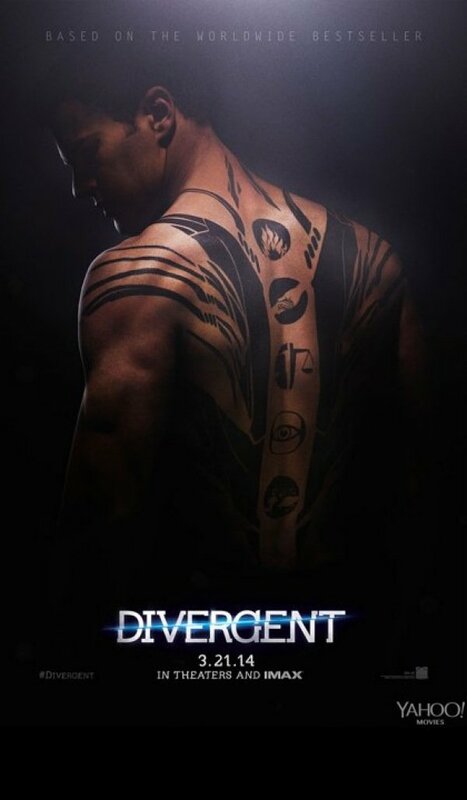 As tattoos are a preferred form of expression among Tris and Four's faction, Four isn’t exactly a rebel for having a back covered in ink, but it it’s probably less usual for someone to mark themselves with all of the faction symbols, which is what he has going on down the center of his back. The clip, which comes to us from Yahoo gives us an indication that Four’s not quite so eager to be categorized, despite the rules of their society, which encourage everyone to know their place. Divergent arrives in theaters March 21. Summit recently set the dates for the sequels, with Insurgent set to arrive in theaters in March of 2015, and Allegiant lined up to release in March 2016. Director Neil Burger will not be returning for the second film. From what Summit says, it sounds like it’s a matter of scheduling, as Burger will be busy working on Divergent’s post-production while production on Insurgent gets started. On the bright side, if all goes well and according to plan for the franchise, fans will have a new move to look forward to each year over the next few years.